I was thisclose to choosing this recipe for Project Pastry Queen last time it was my choice. But I was seduced by cranberries, and thus I missed yet another chance to tackle these cookies. Thanks to Rebeca of Through the Looking Glass, I had my chance this week! The recipe calls for pecans and walnuts, but I omitted both. I also used half white chocolate chips and half semisweet. I just love white chocolate chips in chocolate cookies. These cookies are rich: 8 ounces of bittersweet chocolate, 3 ounces of unsweetened chocolate, and 1 1/2 cups of chocolate chips. They only have 1/3 cup of flour, but 3 eggs. 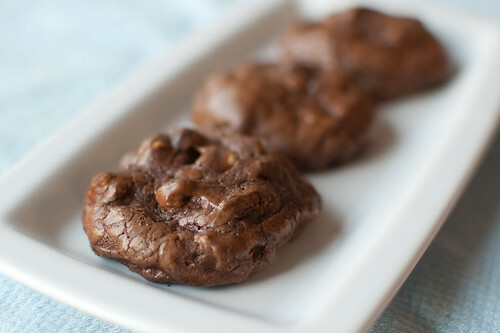 So they are super fudgy, chewy, and kind of a cross between a cookie, a brownie, and fudge. They are on the small side, which is fine. A few bites will do ya! Enjoyed hot from the oven with a glass of milk, they are an awesome afternoon snack (or breakfast, or dessert, or midnight snack). Rebeca has the full recipe on her blog, and check back next week for Pear-Ginger Bread. Triple chocolate? Go on, twist my arm! Looks amazing. yum! they are on my list for this week. glad to see that switching out the nuts for more chocolate :) worked well. i was afraid if i did the same, the cookies would be on the flat side. These look great - any dessert that mixes the qualities of brownies, cookies, and fudge is perfect in my book. Mmmm...love the shiny crackly top.